Repetitively pulsed discharge in air is a power reduction strategy based on pulsed electron heating. 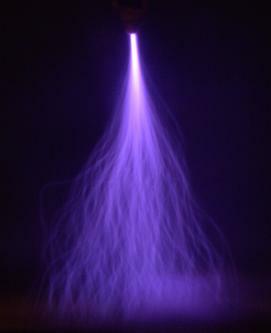 Pulsed power is a very effective way of producing non-thermal plasmas at low energy costs. However, costly pulsed power generators able to produce ns-rise time pulses of several kV with frequencies of 10-100 kHz are needed. 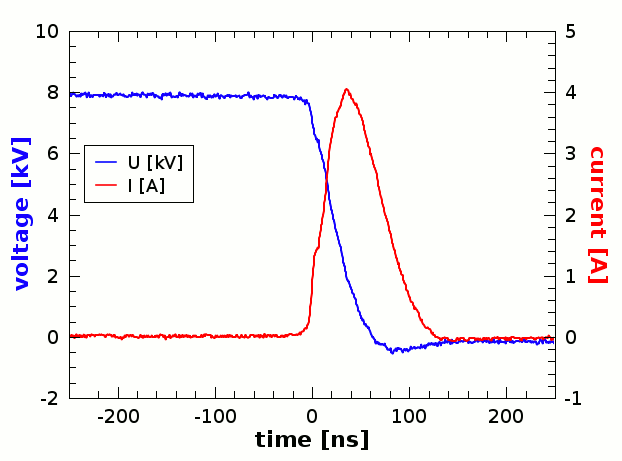 We therefore investigated an interesting pulsed discharge generated by a cheap DC power supply. This novel streamer-to-spark transition discharge with short strong current pulses (named Spontaneously Pulsing Transition Discharge, SPTD, or Transient Spark, TS) generates very active non-equilibrium (cold) plasma. 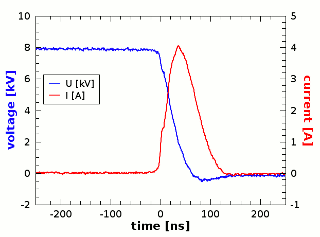 When a DC high voltage of a few kV is applied to the point electrode of a non-uniform field gap, streamer corona appears. It is typical with small current pulses of streamers (~10 mA) with a repetitive frequency of 10-30 kHz, during which the discharge voltage remains fairly constant. As the voltage is further increased, the streamers establish a conductive channel that leads to a spark formation with excessive current pulse (Fig. 1). Fig. 1. Photograph of TS in needle – water gap 4 mm long. Typical voltage and current waveforms of TS. In our case, the spark pulse current is limited in by 1) the ballast resistor R that drops the voltage as the current increases, and 2) the capacity C between the electrodes that is small (order of 10 pF). Thus, even if the sparks forms, it is only transient since the discharged energy is small (~0.1-1 mJ), that is why we call this discharge transient spark. After the pulse, C is recharged by a growing potential on the stressed electrode. As soon as C is charged enough again, it triggers a new pulse. This transient spark becomes then a repetitive streamer-to-spark transition discharge, with each spark pulse (~1 A) preceded by one or a sequence of streamer pulses. The repetitive frequency of pulses is 0.5-5 kHz, and increases with the growing applied voltage. Thanks to the very short spark pulse duration (~100 ns) given by the small C and a limiting R, the plasma remains cold. By setting the values of R and C (C can be set by the length of the HV cable or by filtering Ccable + Cprobe by a small resistor put very near the high voltage electrode, Fig. 2) we can either obtain the transient spark pulses and regulate their amplitude, or obtain a continuous discharge. This pulse-less DC glow discharge typically appears after the spark pulse if R ≤ 1 MΩ and so the voltage drops to a certain small value but not zero, high enough though to sustain a small current (~mA). Fig. 2. Schematic of the electrical circuit of transient spark. The TS has already been successfully tested for several environmental and bio-medical applications (see sections 2. Bio-medical plasma applications and 3. 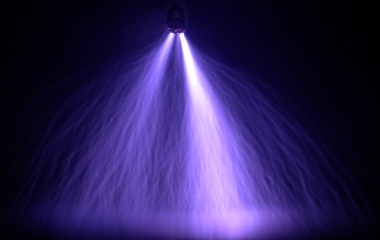 Environmental plasma applications ), and extensive fundamental research of TS using several electrical and optical diagnostic methods has been performed (see subsection 1.2. Diagnostic methods).